It’s hard to believe that the program began the same time that TV shows like Happy Days and Little House on the Prairie aired. Today, reruns often play in the background during visits between Dolphin Companions and nursing home residents. The special distinction of the Rev. Thomas’ program was its one-to-one philosophy: Each volunteer, known as a Dolphin, visits a resident that they are matched with, becoming a special friend to that person. The Dolphin name was selected because the sea mammal has long stood for joyfulness, traveling through life together, and even rescuing sailors at sea. If our volunteers can rescue their fellow human beings from loneliness, they are, indeed, Dolphins. Twelve Episcopal churches (Merion Deanery) agreed to sponsor the program in its beginning. Over time, the small start-up program, then known as Dolphins of Merion Deanery, saw a steady growth in the Philadelphia suburbs. As the program continued to expand—from two nursing homes to 23 residential retirement communities—the need to change the name to Dolphins of Delaware Valley arose. To better represent our focus on companionship and our continued expansion throughout Philadelphia and the suburbs, the program became Dolphin Companions in 2017. It has expanded into Philadelphia, Bucks, and Berks counties, while continuing to grow partnerships in its original home base of Delaware, Chester, and Montgomery counties. Marilyn Knox, volunteer coordinator, recruits, trains, and matches volunteers with nursing home residents. She gives continued support to both volunteers and residents, and maintains strong relationships with nursing home staff. The program works because of our volunteers who make life more enjoyable for the seniors they befriend. That faithful friend will laugh with them, weep with them, reminisce with them, and listen to them. Dolphins usually visit once a week for about an hour, but schedules can be flexible. This flexibility continues to be a huge attraction for volunteers. Forty years ago, the Rev. 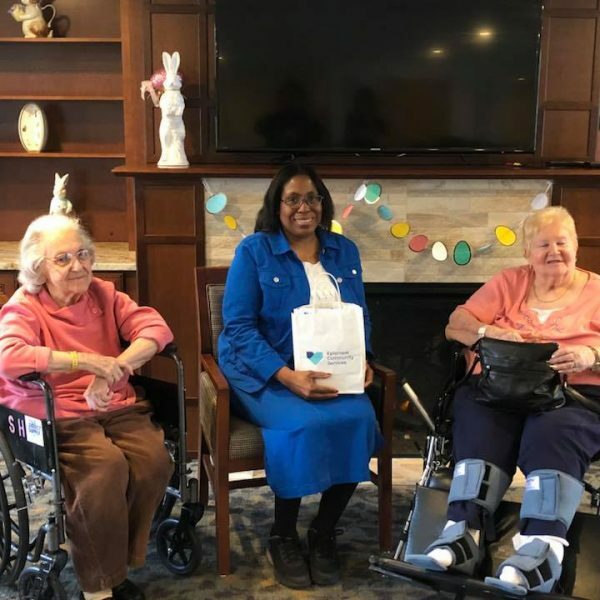 Thomas heard the longing of the lonely nursing home resident who wished someone would visit just for them, so she did something about it. That compassion and service is the legacy of Dolphin Companions—and it lives on with you today. Thank you for being a part of this journey. If you are interested in sharing time with a lonely senior, contact Marilyn Knox, volunteer coordinator, at marilynk@ecsphilly.org.